CWF Hardwoods Clear Wood Finish penetrates and bonds to exterior wood providing a flexible, long lasting rich matte finish, even on tough exotic hardwoods such as Ipe, Pau Lope?, Ironwood and Mahogany. 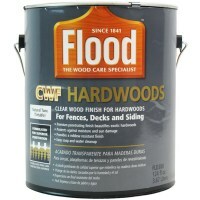 FloodPro Supreme Performance saturates, seals and stabilizes wood to minimize cracking, warping and other damage caused by moisture and sun. The unique formula, combined with premium U.V.-absorbing transoxide pigments, provides a finish that accentuates the beautiful color of your wood for years to come. Apply between 50? and 90? F. Do not apply in hot sunlight. Apply one coat of CWF-Hardwoods.